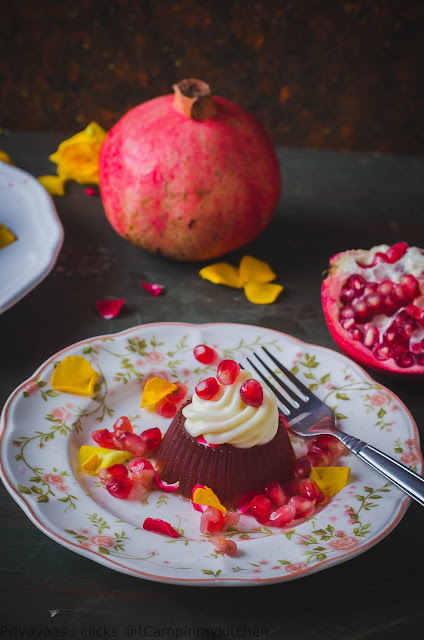 A simple dessert that looks pretty and also tastes delicious. A dessert that can be made without any sweat in the kitchen. 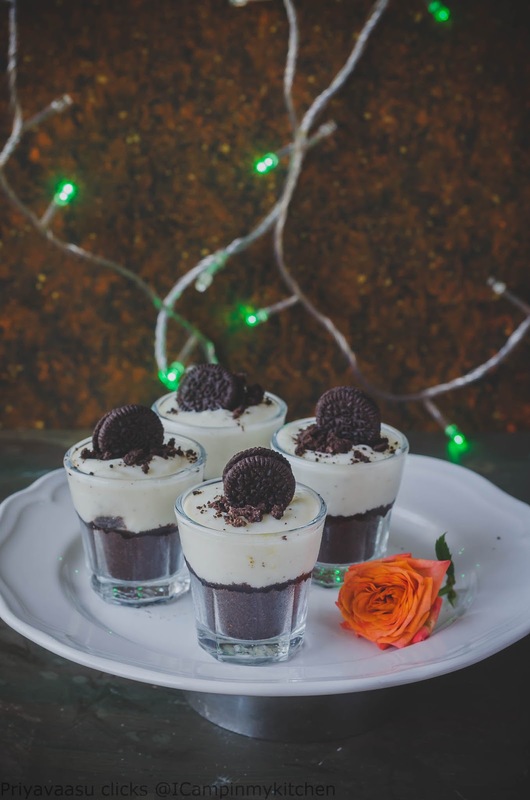 No bake cheesecakes, an elegant dessert that will look pretty on your dining table and will get you all the praise. When i planned the menu for this week's Thankgiving meal theme, i wanted to have a main, side and a dessert. Thank god, i was able to make all the 3 dishes and click them together, for the fesive look. Lime and sesame seeds rice and cauliflower tikka masala were made the same day and whereas this cheesecake was made a day earlier, so it sets well and is ready for the dinner next day. I have used labneh or curd cheese to set the cake. It didn't need any sort of setting agent, as it is curd cheese, it will set the cake well after 4-5 hours of refrigeration. Since i have use shot glasses, the cheesecake sets pretty fast. If using a tart pan or a larger base to set the cake, do wait for 6 hours for it to set well. 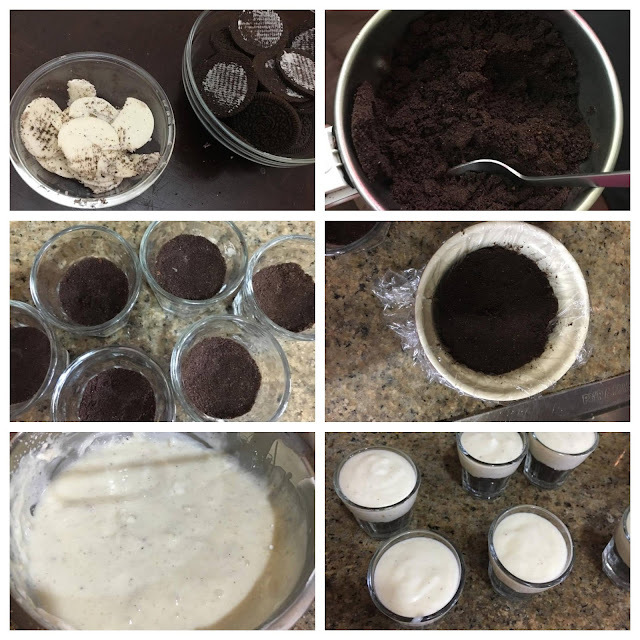 I have also removed the cream part of the cookies and added it to the cheese, so you will get the taste of cookies and cream in the cake. To make it more alluring, i have also added a tsp of instant coffee! hmmm, the aroma of mesmerizing coffee in the base and creamy cheese, makes this dessert, more tempting! I have used 6 shot glasses and one muffin cup to set the cheesecake. If needed you can use a tart tin with removable base also. 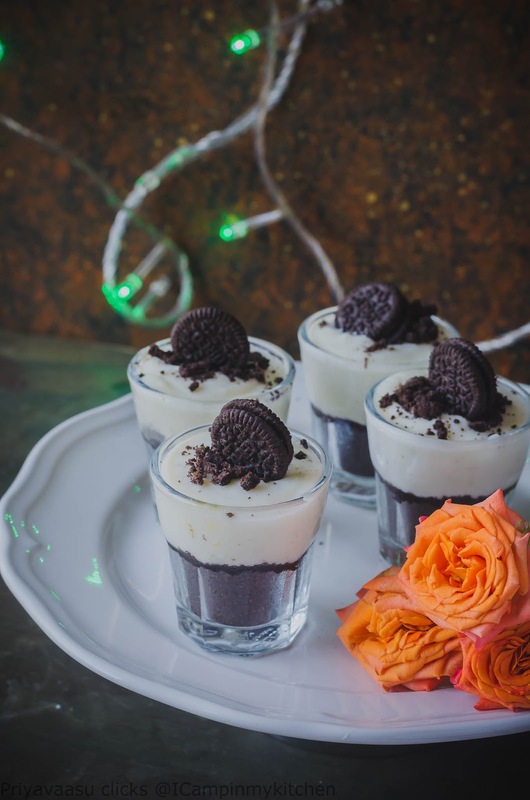 Divide the cookie crumb amongs 6 shot glasses. I have used about 2 tbsp of crumb for each glass. There was about 3-4 tbsp crumb leftover, which was used in the muffin cup. If setting in a muffin cup, lay the cup with cling wrap, see to that some of it, hangs outside the cup, so it is easy to pull the cheesecake out after it is set. Let the base rest in the fridge, while we make the filling. 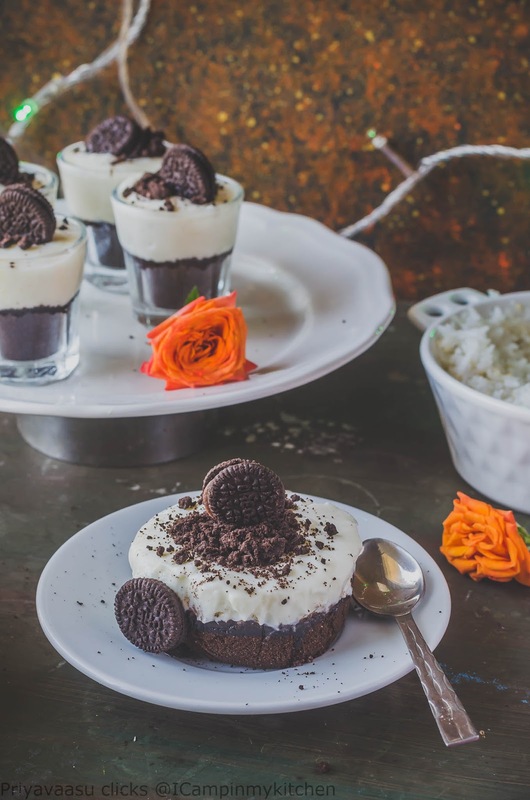 In a wide bowl, add labneh, the cream of the oreo cookies, and condensed milk. Using a electric beater, whisk it all together. It wont be fluffy, it will be like a thick cream. Do not worry, the curd will set the cheesecake well. If you prefer u can add some crushed oreo cookies to the cream mixture. Add 2-3 tbsp of this cream on top of the cookie crumb set in the shot glasses. After filling the 6 shot glasses, there was about 1/4 cup of cream leftover, which i filled in the muffin cup. Wrap the individual shot glasses with cling wrap and let this cheesecake sit in the refrigerator and set for atleast 5-6 hours minimum. Since it is set in shot glasses, it will ready in 3 hours itself, but if setting it in a big tart tin as one cheese cake, leave it to set for a minimum 6 hours. 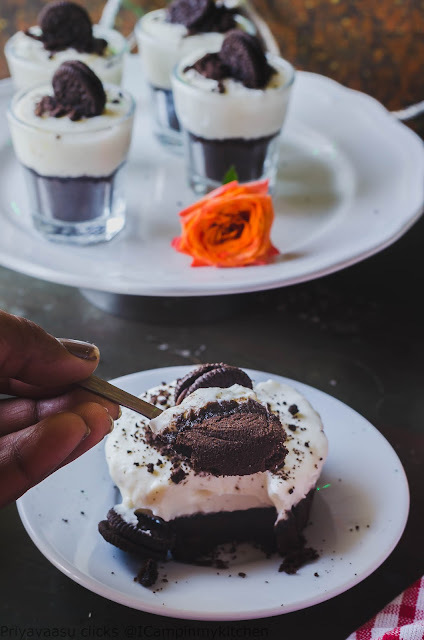 To serve, remove the cling wrap, garnish it with little cookie crumb and mini oreos on top and serve immediately. 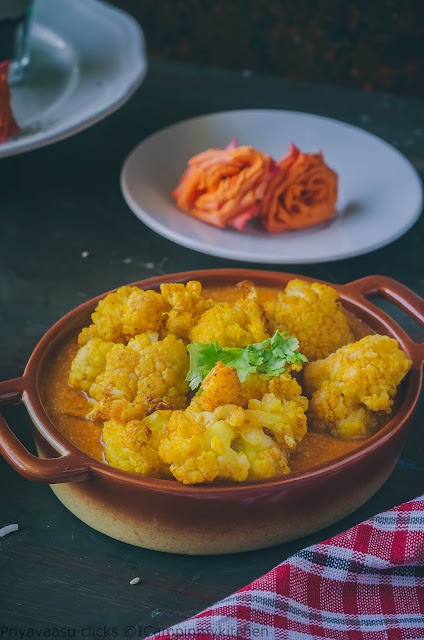 The second dish i made for my thanksgiving theme meal is this yummilicious cauliflower tikka masala. I have been making paneer masala for a quite long itme now, though the recipe is not here in the blog. 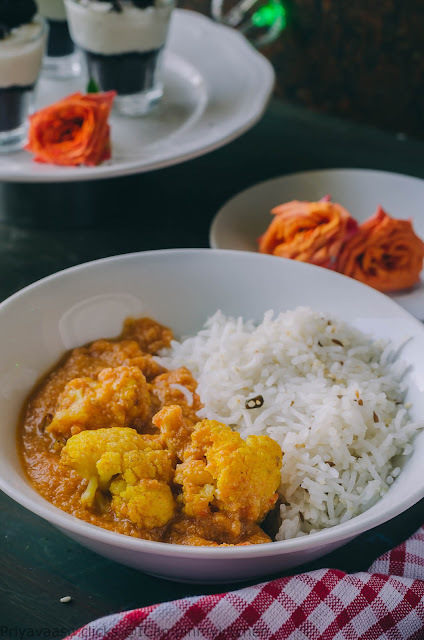 So, i first thought i would make my favorite paneer tikka masala, but then with cauliflower in season, i have got two beautiful flowers sitting in my refrigerator. Didnt want to waste them, so i made this finger-licking gravy and served it with beautifully roasted cauliflower. The roasted florets had a nice crunch and the gravy complimented it so well. If you are planning for a simple meal i would definitely recommend this tikka masala. 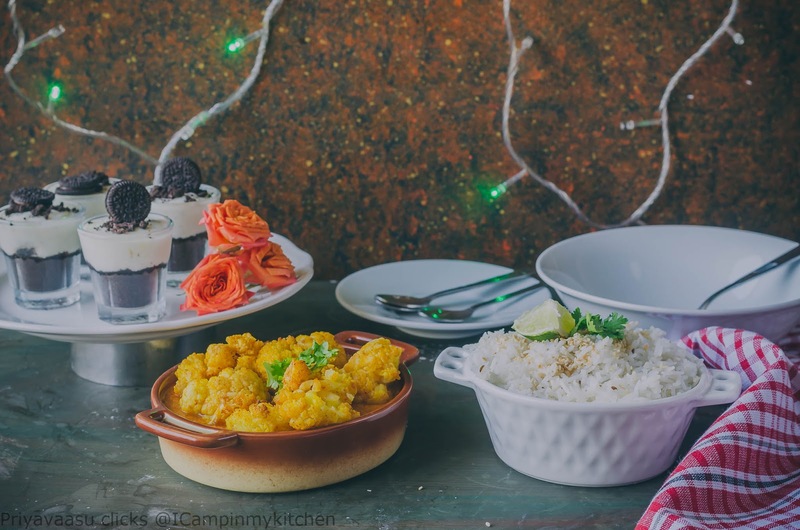 It can be paired with roti and as well as rice. I served it with Lime and sesame seeds rice. The rice had only less spice and it paired so beautifully with this side. Altogether a delicious meal, that got ready in minutes. 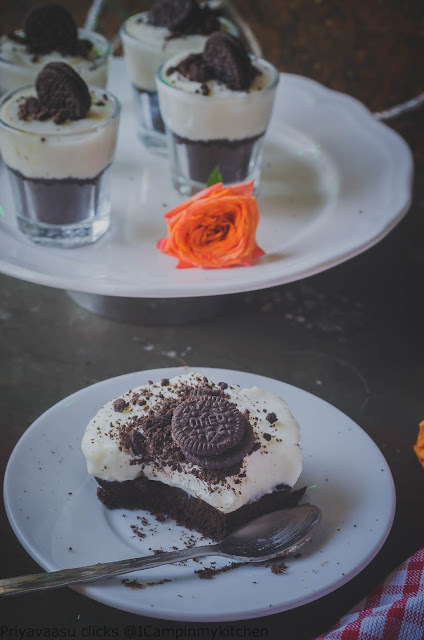 For the dessert i made a simple No Bake Oreo cheesecake, recipe is coming next in my kitchen. 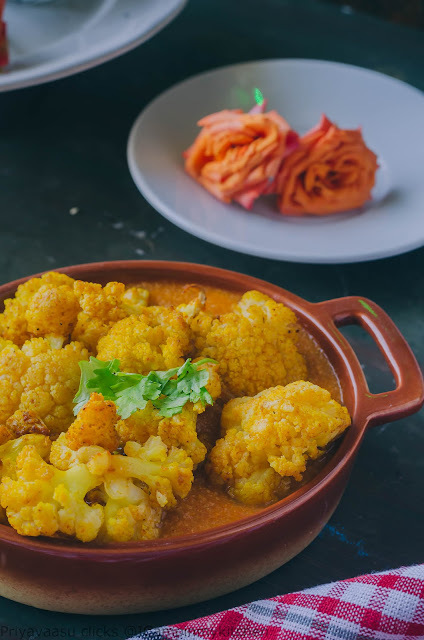 Clean the cauliflower florets, In a bowl, add the florets and pour hot water on top, until the florets are fully submerged. Add turmeric powder to this and let this sit for 8-10 minutes. Drain and keep aside. In a small bowl, take oil, tandori masala and salt. Mix well. Take the florets in a baking pan, pour this spice oil on top, and using your hands coat the florets well with this oil. Preheat the oven to 200C and roast the cauliflower for 45-50 minutes or until the top of the florets are nicely browned. Since i was making this for my meal, i removed the florets when they are nicely browned, if you prefer a little charred florets, let it roast for another 10 more minutes. While the florets are roasting. let us prepare the masala. Heat a pan, add a tsp of oil, when it is hot, add onions, green chili, and garlic. Saute until the onion turn translucent. Next add the tomatoes and 1/4 cup of water. Let it cook until the tomatoes turn mushy. Now add all the spice powder, salt and the cashews, and another 1/4 cup of water, let it be on the heat for another 8-10 minutes for the spice powder to blend well. Once done, remove from heat, let it cool for 10 minutes. Now blend the ingredients with 1/2 cup of water. Blend it smooth. Now again, in the same sauce pan in which you sauteed the ingredients, heat another 1 tsp oil, when it is hot, add the blended masala to it. Let it cook until the oil separates on top, about 8-10 minutes, if you feel the gravy is too thick, add 2-3 tbps of water to it. Remove the gravy from heat, just before serving, add the roasted cauliflower florets on top and serve hot with rice or roti. Thanksgiving, a festival celebrated in USA, canada and some Carribean islands. A typical harvest festival celebrated thanking for all that we are blessed with this day. We too have our very own thanksgiving, celebrated in the month of January. It is called by different names Pongal, Makar Sankranthi, Bihu,Lohri etc. We thank the glorious sun for blessing us with a good harvest. When i took the theme : Thanksgiving dishes for this week BM, i seriosuly didn't know to cook, all i knew is they cook turkey!! Thanks to google, I did a quick reading first. My god, what a variety!!! With so many vegans and vegetarians these days, you can plan a perfectly vegan thanksgiving dinner too. 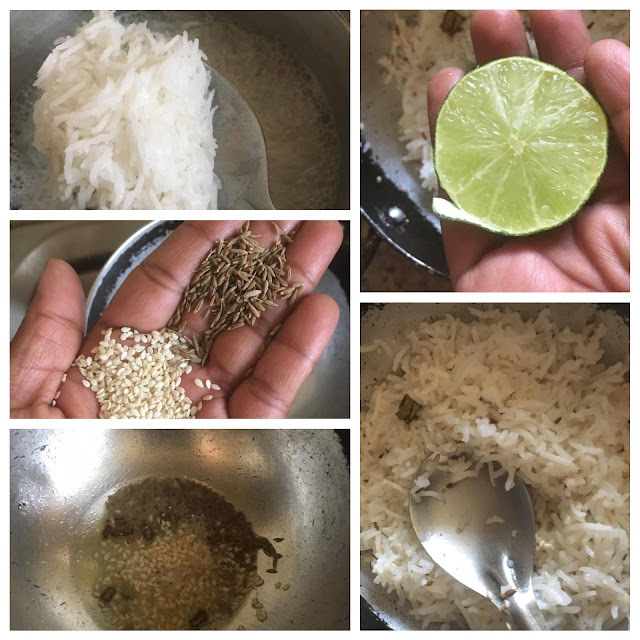 During one such read, I came across this rice recipe @ Martha Stewart site. I have made some additions to the recipe. The Original didn't have chilies and cumin seeds. Since i wanted a little heat in the recipe, i have added one green chili. You can skip it totally or substitute it with some ground pepper. 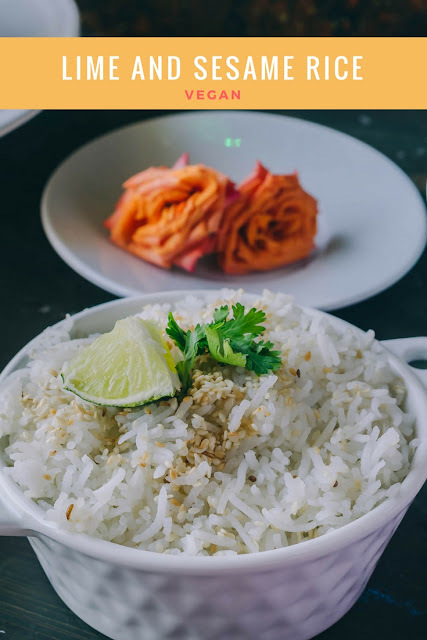 The rice was mildly flavored, the crunch of sesame seeds in every bite was very good.I paired the rice with some cauliflower tikka masala. Mild rice with a spicy side, tasted divine. Wash rice 3 or 4 times or until the water runs clear. Soak the rice for 20 minutes in water. Drain and keep aside. Heat a sauce pan with 3/4 cup of water, add the drained basmati rice to this. Let it boil and the rice cook well. 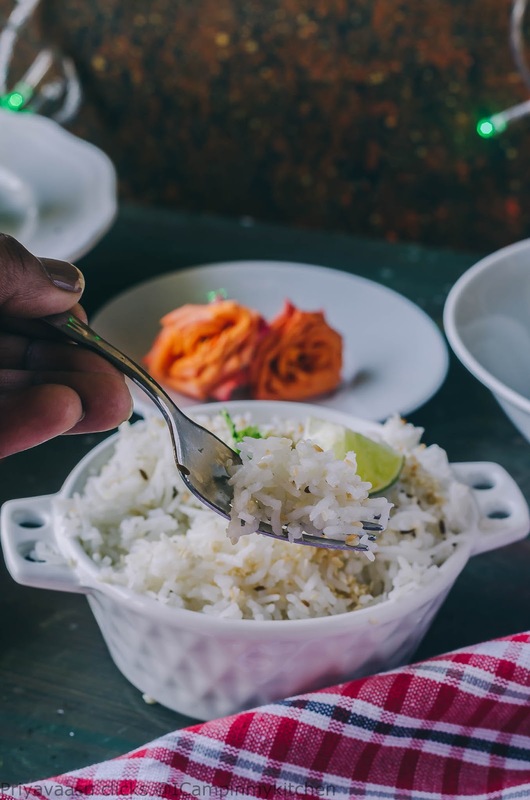 Once the rice is cooked, drain the excess water and keep it aside. In a wide pan, add oil, once it is hot add chopped green chilies, now add cumin and sesame seeds to this and take it off the stove. The sesame seeds will turn brown in the residual heat. To this now add the drained rice, toss well. Add lime juice and salt to this. Mix well, garnish with coriander leaves, and garnish the rice with some toasted white sesame seeds. Serve the rice with some spicy side for a complete meal.I served it with some cauliflower tikka Masala. 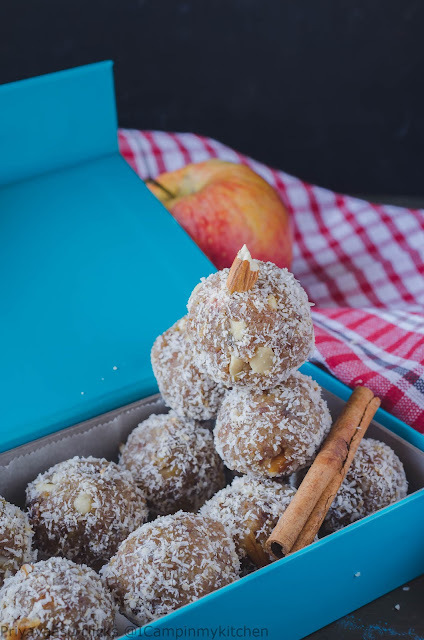 Apple ladoos, yes you read it right! Now to name them in english as balls didn't sound right, have you ever felt this dilema of how to name your local food in English! 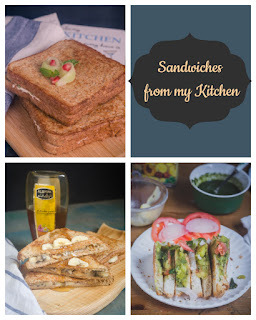 I know there is no need to do it, but being a food blogger, if you have mixed audience, how to make your post reach them? Some tension! Originally truffle as a dessert is a chocolate confectionery, now this doesn't have any chocolates, but then i found some recipes named as truffles without chocolate, so went ahead and named this too as a truffle recipe. 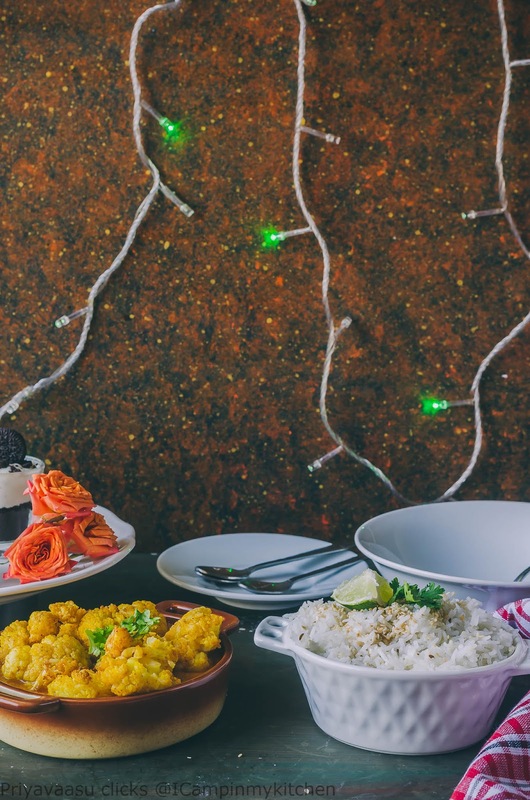 Ok now, coming to the recipe, i made this recipe for Diwali and it was a great hit. I was so busy during Diwali, i couldn't click pictures of these that time. 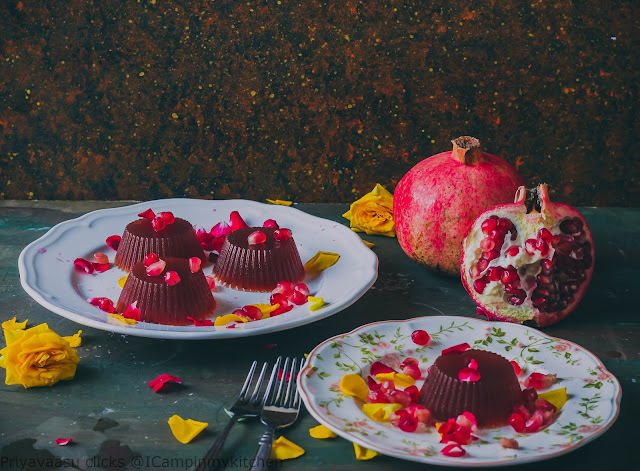 So when i saw the theme of fall fruit desserts, i knew i will be making these again. I wanted to make some guilt-free sweets for Diwali, that is the main reason behind this recipe. 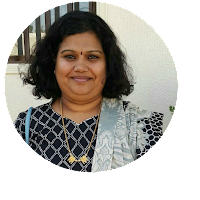 With so much effort done for the healthy life-style and exercising, i didn't want the festival to be a spoil-sport. 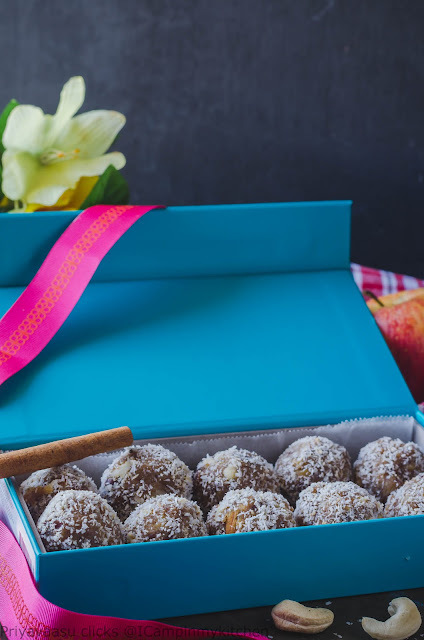 These truffles are a great dessert for any festival and they make a lovely gift for your loved ones. 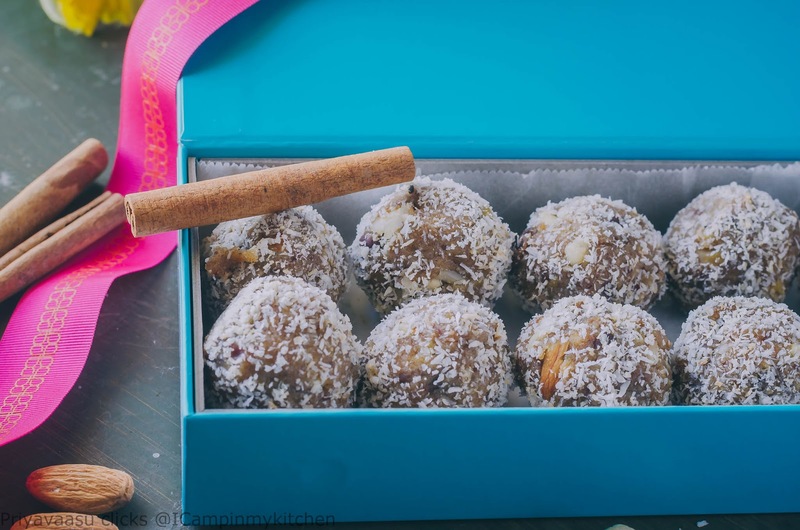 You can make them as balls or press them down on a flat plate and cut them into bars. They make a great snack anytime. 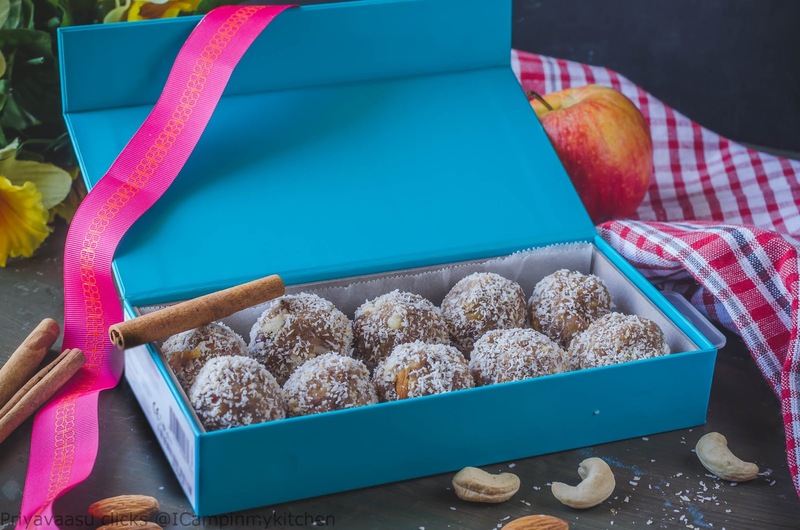 Not only they satiate your sweet tooth, it is guilt-free too. Wash the apples well, Grate them fine. Take the dates, remove the seeds, grind them to a smooth paste. I used a soft variety, so didn't soak the dates. Heat a wide pan, dry roast the oats and dessicated coconut separately. Take care not to burn them, it will spoil the taste of the truffles. Once roasted, let both the ingredients cool well. 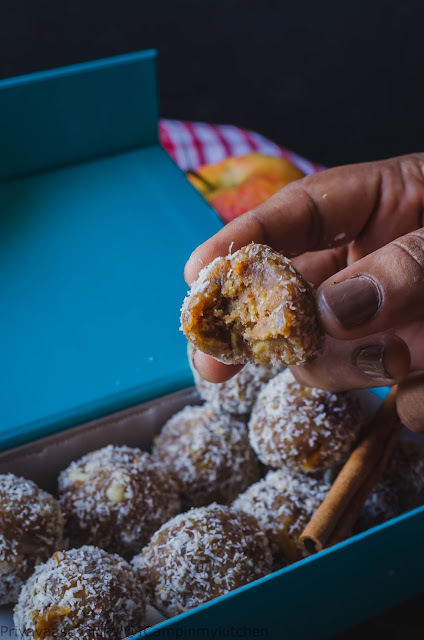 Take them in a mixer, add candied ginger to it and grind them all to a fine powder. In the same pan, in which you dry roasted oats and coconut, add butter and heat. Once the butter melts, add the shredded apples and cinnamon powder. Saute it well for 10-12 minutes in a simmer flame. The apples should get soft well and change color. To the apples, add the dates paste and saute well for another 8-10 minutes. 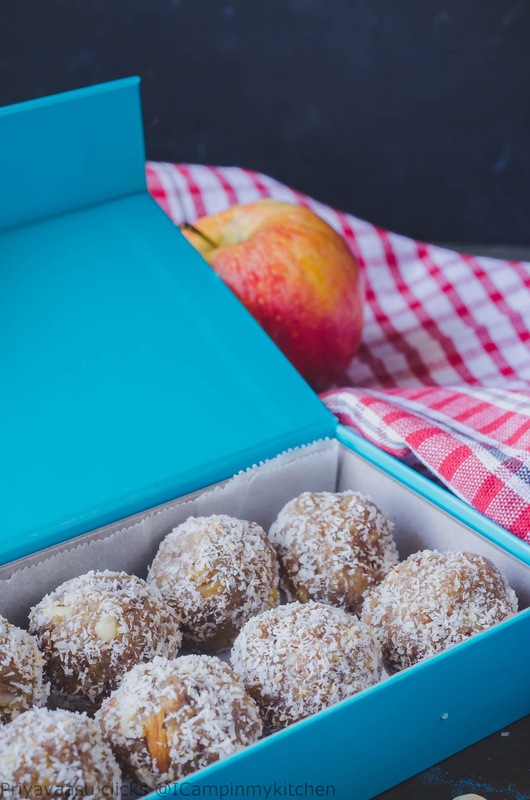 Both apples and dates should blend well and come together to a sticky paste. Now to this add ground oats and coconut powder. This powder adds volume to the mixture and makes sure they come together as a mass, which will be easy to shape. Add chopped nuts to this and mix well. Let the mixture come to touchable warm. then shape them into ping-pong sized balls, and roll each ball with dessicated coconut. 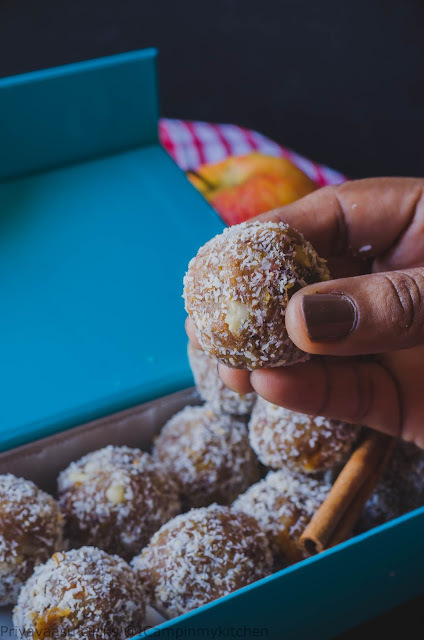 Store the ladoos in an air-tight container in the refrigerator. Since the ladoos are made of fresh apples and coconut, there is a chance it might go bad, if kept outside for a longer time. Enjoy these healthy and yummilicious ladoos/truffles whenever you feel like having something sweet! Pomegranates, a fruit that is so pretty on the inside, tough on the outside, a little effort to score it open, it offers edible ruby reds, very Philosophical right!!! Every part of the fruit, right from the arils to its pith, is used for medicinal purposes. 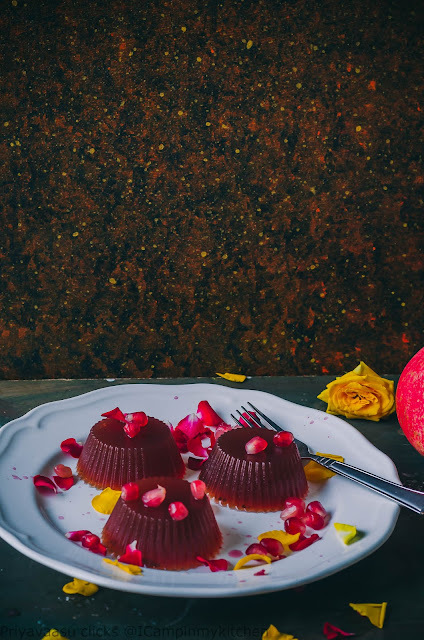 This ruby studded fruit is another fall season gift to this world. 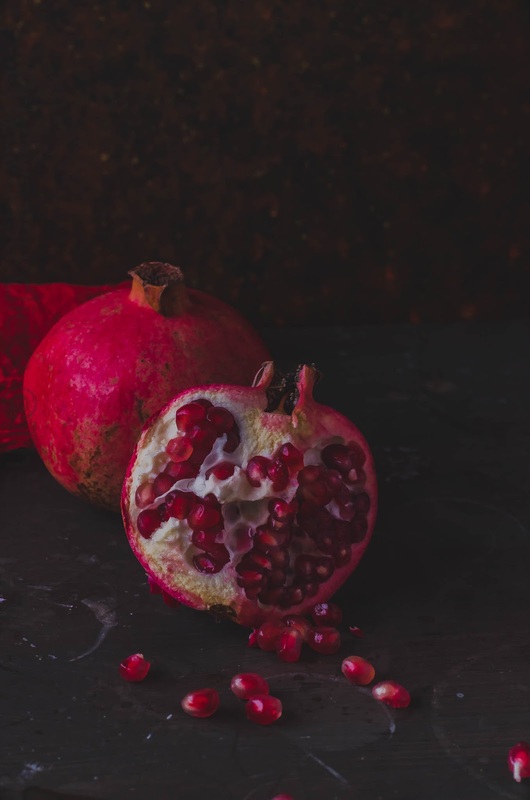 Pomegranate also has lot of fun facts in connection with mythology. It is believed to be a fruit from the paradise, and it is also believed that the fruit is a fertility enhancer and women of child bearing age should eat this fruit in abundance. This is because the fruit is full of healthy folates/folic acid that is much needed for a pregnant women. When i decided on the theme Fall fruit desserts for this BM, i knew i will making this jelly. This recipe is from the book Pomegrantes & roses by Ariana Bundy. I was lucky enough to borrow this book from my blogger buddy Huma Kalim of Gheza-e-shiriin. I love her blog name, it is so royal to pronounce na! 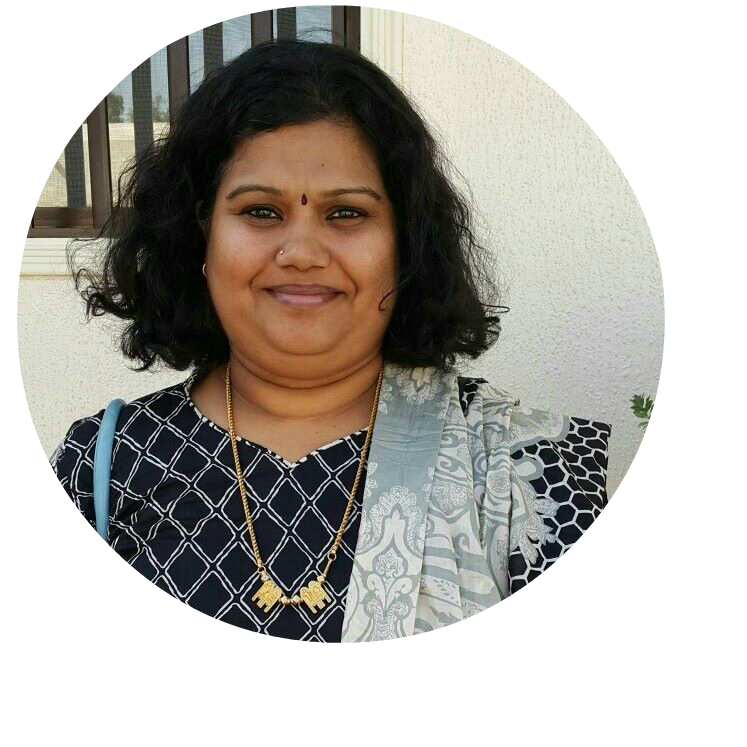 She is such a down-to-earth person, she has the habit of collecting regional specific cuisines. I loved this cook book by Ariana Bundy, and it identified me and my taste of cookbooks. I love cookbooks that weaves a story around the recipe, not just a page that has ingredients and procedure! What a realization!! Thanks to huma for the book! I have so many recipes marked in that, happy i could do atleast one now. 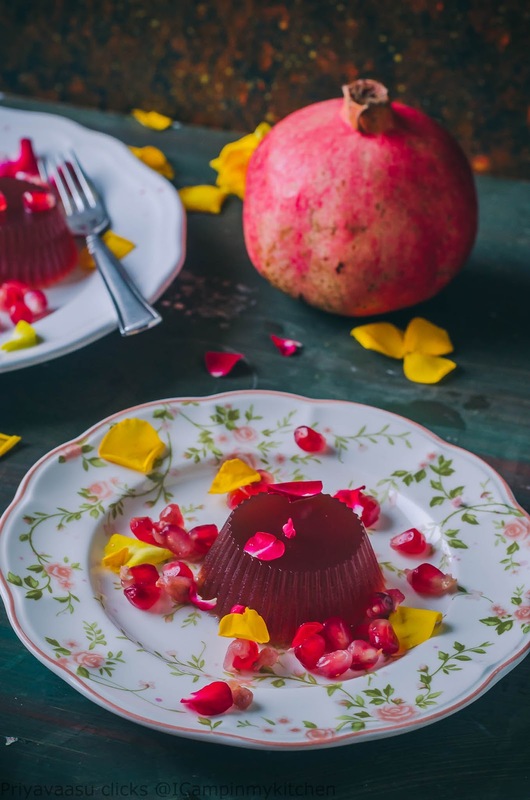 Pomegranate jelly,a simple to make dessert. All you need is pomo juice and agar-agar/gelatin leaves. Since this is a vegetarian blog, i have used agar-agar powder for the jelly. To make it more rich and royal, i have topped the jelly with white chocolate ganache garnished with some pomo pearls. 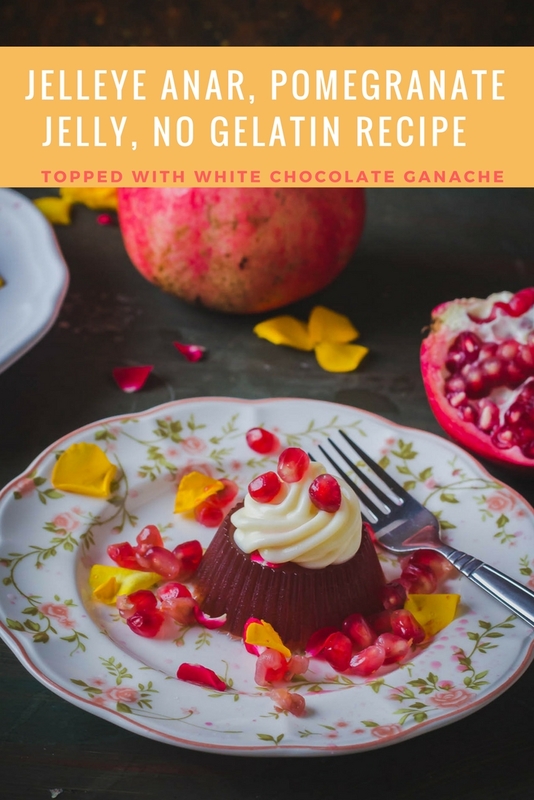 The ganache adds a great texture and richness to the otherwise simple jelly. Take the juice in a saucepan and heat it. Remove 2 tbsp of juice from the sauce pan to a small ball, dissolve the agar-agar powder in that juice. When the juice in the saucepan, starts to boil, reduce the flame to simmer and add the agar-agar dissolved juice to it and whisk it well to combine. Let it sit on the stove for another 10 minutes in a simmer flame. Take it off the stove. Arrange the silicon muffin moulds in a muffin pan. Slowly fill the muffin moulds till 3/4 with the pomegrante juice. Refrigerate until set, atleast a minimum of 3-4 hours. You can add some fresh pomo pearls in each of the muffin mould for some texture, since my kids might not like it,i skipped that idea. To Make white chocolate ganache. Take white chocolate in a bowl, chop it into pieces. Heat cream in the microwave for 10-15 seconds, Pour the hot cream over the white chocolate. Let it sit for 5 minutes, then mix it well with a spatuala. Let the ganache sit for 10 minutes before use. Remove the jelly on to a serving plate. Since it is set in a silicon mould, it was very easy to transfer it to a serving plate. Just loosen the sides of the mould,invert it on a plate. Pipe a blob of ganache on top of the jelly, garnish it with fresh pomegranate pearls and rose petals and serve immediately. When we think about fall fruits, the first fruit that pops in my head is apples. Yes, now they are available all throughout the year, but web says in northern hemisphere fall is when they are harvested. Now this pretty cake too adds up to that list. 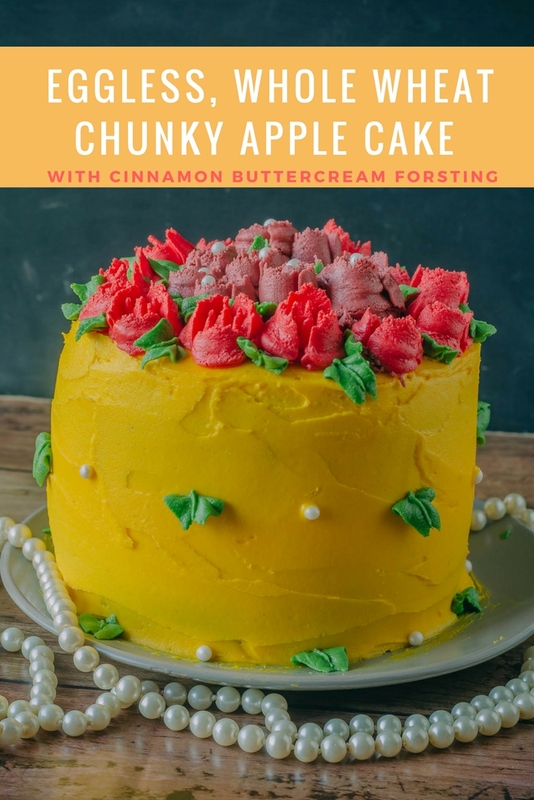 Chunky apple cake filled with cinnamon buttercream frosting. First i thought of keeping the cake plain, with just a dust of icing sugar. 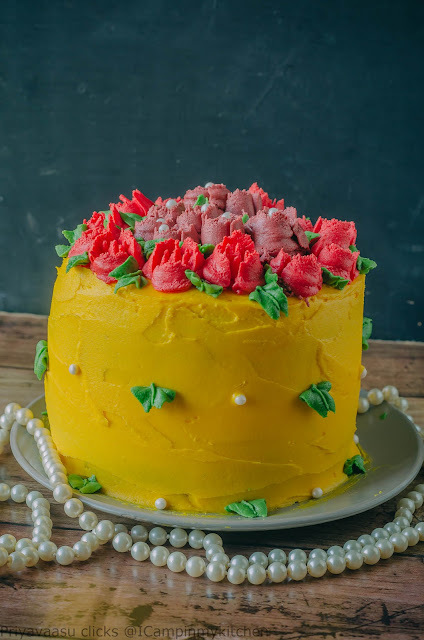 But then, I had some leftover buttercream frosting didn;t want to waste it, so filled and frosted and piped some roses and tulips using the russian nozzles. This is one of the best cakes i have made this date. The recipe is same as that of my Vanilla sponge cake, i have used curd here instead of buttermilk and thinned it down with water. The cake turned out super soft and fluffy. I have added apple chunks to the batter and also to the top of the cake. One of the reason i frosted it is to hide this, or else my lil one wouldn't have liked it. They don;t like anything peeping from their cakes. I wanted to fill the cake with some apple compote to give it more of apple pie taste, but then again, i wasn;t sure whether the kids would love it. If making for adults, i would definitely recommend that compote filling inbetween the cake layers. 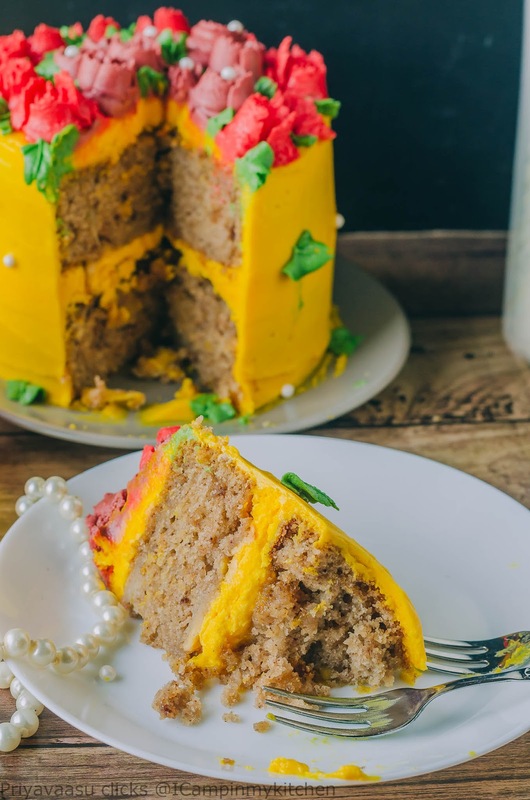 Go ahead and bake this cinnamony apple cake, with frosting or not ,you would enjoy it anyway! Grease 2 4 inch cake pans and lay it with parchment paper. Preheat the oven to 180C. Wash the apple, peel it, core it and chop it into small chunks. Add lemon juice to it and toss, this well prevent the apples from getting brown. In a large bowl, take together wheat flour, baking soda , bking powder and cinnamon powder, whisk them together. This ensures even mixing of all the dry ingredients. Now add half the apple chunk to this flour mix and toss well. Now add sugar to this and whisk well. In a measuring jug, take the curd, add water to it and mix well to combine. To that mixture add oil and mix. Now add this liquid to the dry ingredients in two batches. Using a spatula, combine it together. While mixing, use the spatula to mix in one direction only. Be gentle, while mixing. Adding liquid in batches will help in proper mixing then dumping everything and mixing at a time. Divide the prepared batter into two pans. Now divide the leftover apple chunks and spread it on top of the cake. Bake it in the preheated oven for 30-40 minutes or until a tooth pick inserted in the center of th cake comes out clean. Once done, remove the cake onto a cooling rack. Let it cool down for 5 minutes, then run a blunt knife around the edges of the pan to release the cake. Slowly invert it onto the wire rack and let it cool completely before frosting. Take butter in a wide bowl, using an electric beater, beat it until light and fluffy. Now add 1 cup of icing sugar at a time and whisk again. Once all 4 cups are added, add cinnamon powder and milk to it and whisk. The buttercream should be airy, and smooth.Once done, divide it in 3 bowls. add colors to each bowl and mix with a spatula. I have use yellow buttercream to fill and frost the cake. And red and purple color for the flowers and little green for the leaves. I have used russian nozzles to pipe roses and tulips on top. Mix 3 tbsp of icing sugar with 1/4 cup of warm water and keep ready. 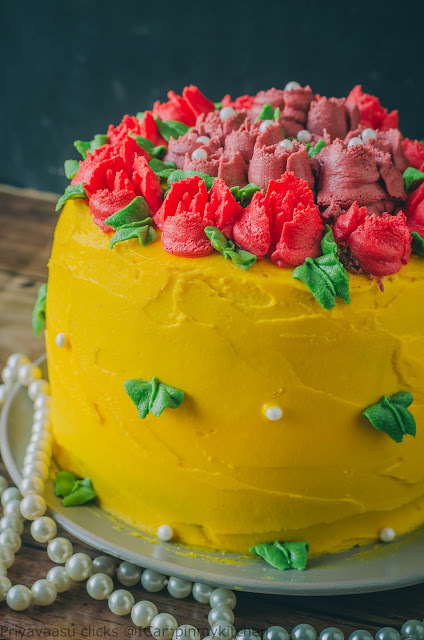 Take a round cake board, add a blob of buttercream to the center and place one round cake in the middle. This blob makes sure, that the cake stays put on the board without sliding. Spread half of the sugar solution on top of the sponge, this keeps the cake soft. 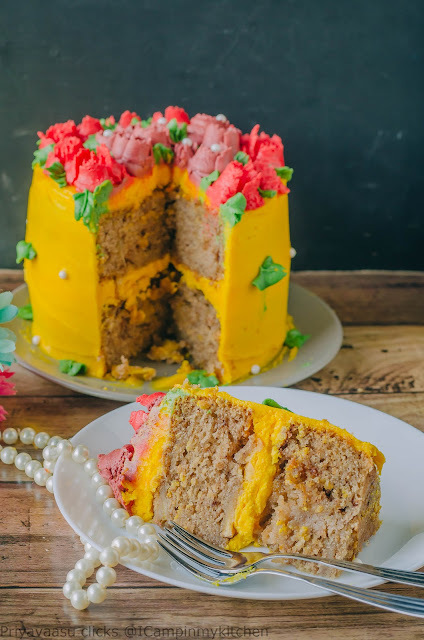 Add a thick layer of yellow frosting on top. Spread it to cover the entire cake surface, do not forget the edges. Now stack the second cake on top of this with its bottom facing the top. Spread the sugar solution on top of the cake. Now add a thick layer of yellow buttercream on top and crumb coat the sides with yellow buttercream. 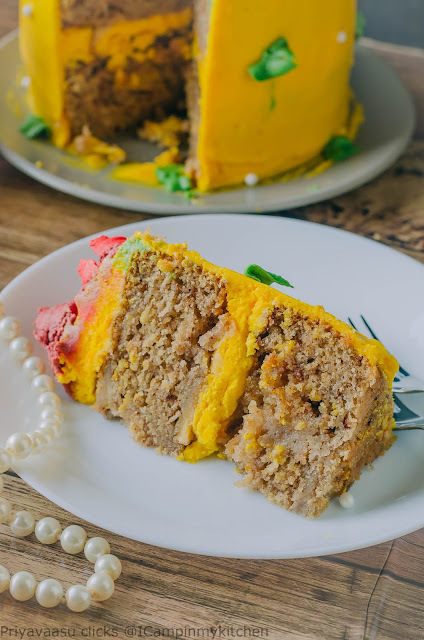 Place the cake in the refrigerator for 10 minutes for the crumb coat to set. 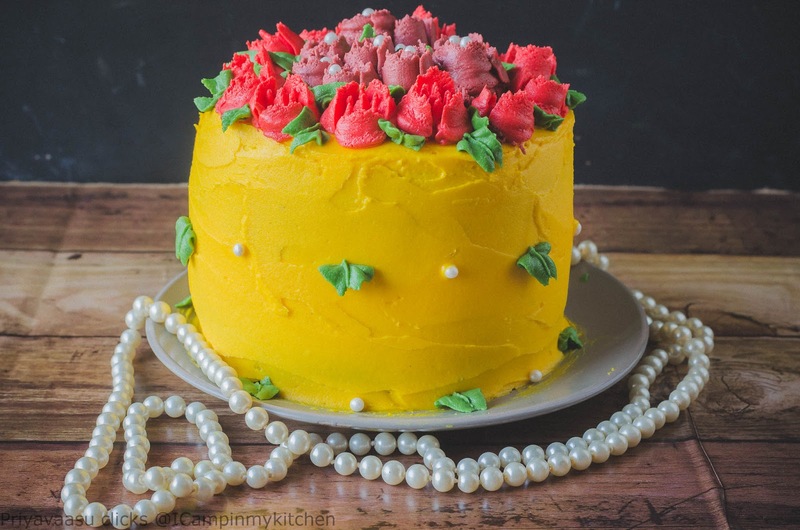 Once set, add thick layers of yellow buttercream on top and using a offset spatuala smoothen it to set. Again refrigerate the cake for 10 minutes before adding any extra details. Russian nozzles are pretty easy and cool to use. They do make lovely flowers with little effort. If you are artistically handicapped like me, then these nozzles do help a lot. 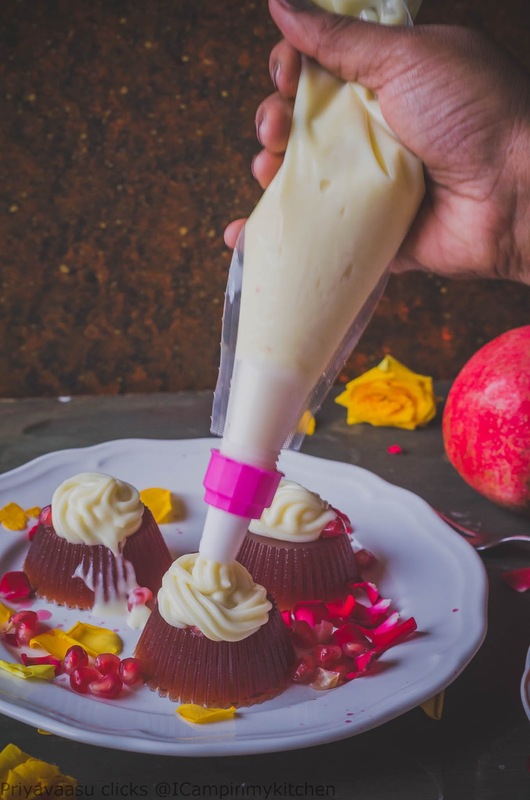 For piping the roses, use the rose nozzle, fit it in a disposable piping bag, fill the bag with red buttercream. Pipe a little base first, without removing your hand, pipe, twist and remove for a perfect rose. Same way for tulips, pipe a little base, pipe and remove. I saw some yoututbe videos before perfecting the technique. I would suggest the same for others too. 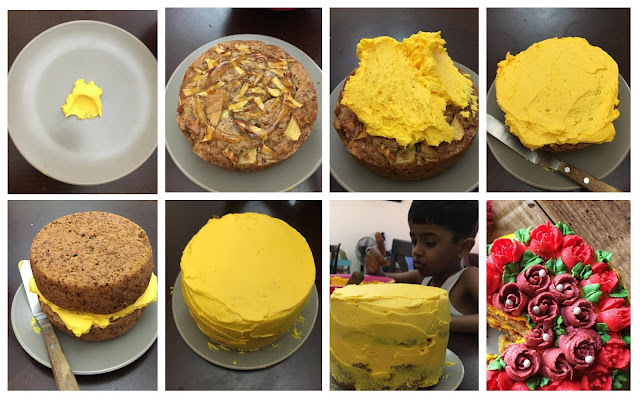 Once done, let the cake rest for few minutes in the fridge then cut,slice and enjoy. 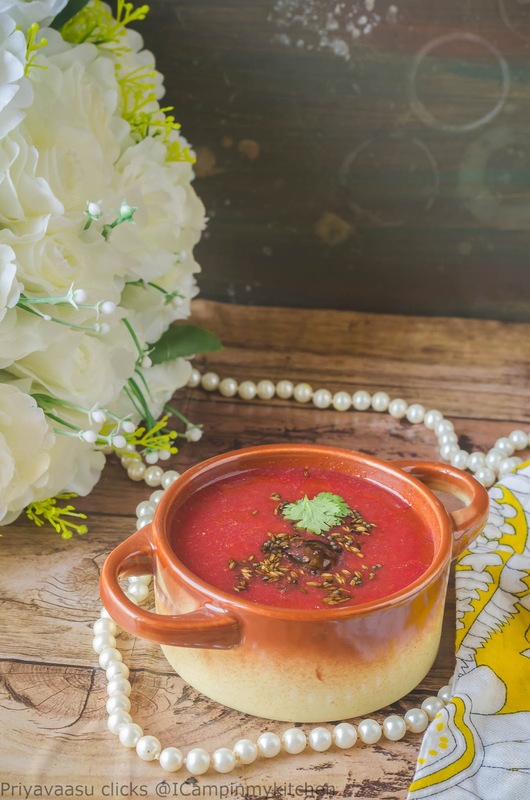 Rasam, an integral part of south-indian meal! I can eat without sambar, but rasam is a must, in my daily lunch menu. Even my kids too prefer rasam over sambar any day. 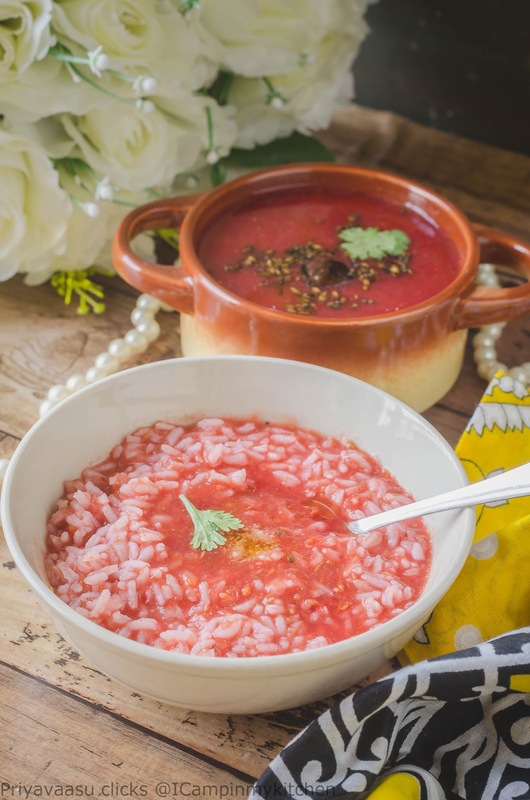 The pleasure of eating hot hot rasam mamu (rice), is something unexplainable, you have to experience that joy! I have an affinity towards beets, i love to include it more in my diet. These days i have trained myself to even drink raw beets juice. 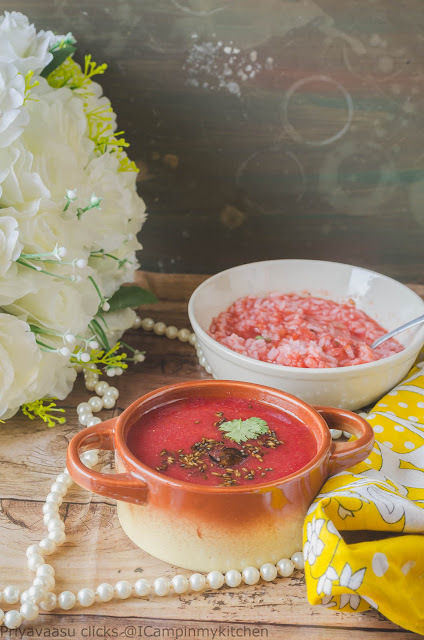 I know for many cooked beets is a put off, even my own SIL love to eat raw beets, but she hates beets curry, as she feels it is too sweet for her palate. If you are like her, you should try this Beets lassi or Beets thogayal, a spicer version of Beets. Ok, now coming to the rasam, it is again one of our favorite, especially my lil ones! He loves this rasam and calls it Blood rasam, yeah i know a bit scary, right! He will ask for second servings on the days i make this rasam. The recipe is very simple, all you need to do is soak some jeera and dal before hand, rest is all done is 20 minutes. Yes a simple meal ready in 30 minutes, pair it with some potato curry, you will have a fab meal ready in no time!! 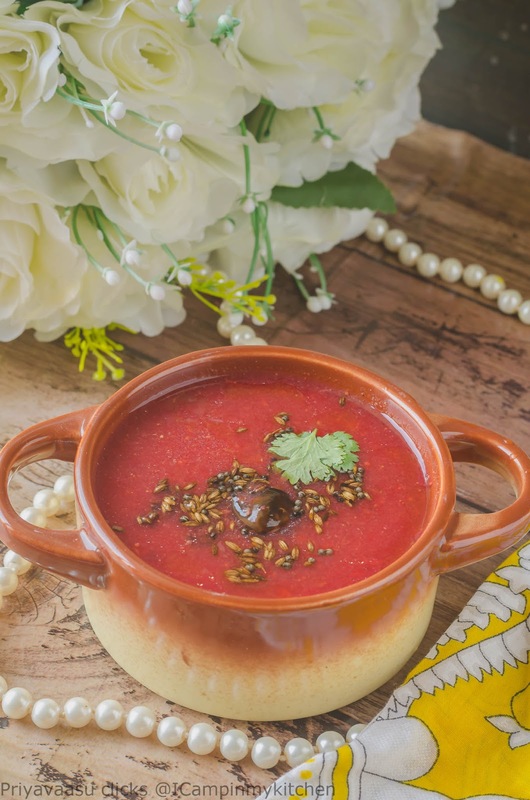 You can also drink this rasam just like soup, with coming winter months, this would be a lovely combo of veggies and lentil, pair it with some bread to make a complete meal. Soak cumin seeds and tuvar dal in 1/4 cup of water for 20 minutes. Sometimes i do it morning itself around 7:30 am and make the rasam around 11 am. But the minimum time for it to soak is 20 minutes. Wash, peel and cube the beets. Take it in a microwave safe bowl, add water to immerse the beets well. Microwave it for 10-12 minutes @ high for it cook. The beets must be fork tender. This can be done on stove-top also. Do not discard the beets water. Let the cooked beets cool completely. 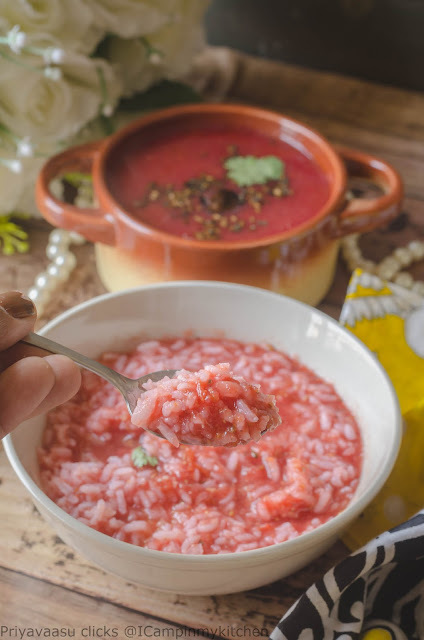 Now take the cooked beets with the water, along with the soaked cumin and tuvar dal with the water, add chopped tomatoes, garlic, ginger, green chili, curry leaves and 1/2 cup of water. Blend them well with a stick blender or using a mixer jar. The liquid should be quite smooth. Now take this blended liquid in a sauce pan, keep it in on the stove. Add rasam powder, turmeric powder and salt to this and mix well. 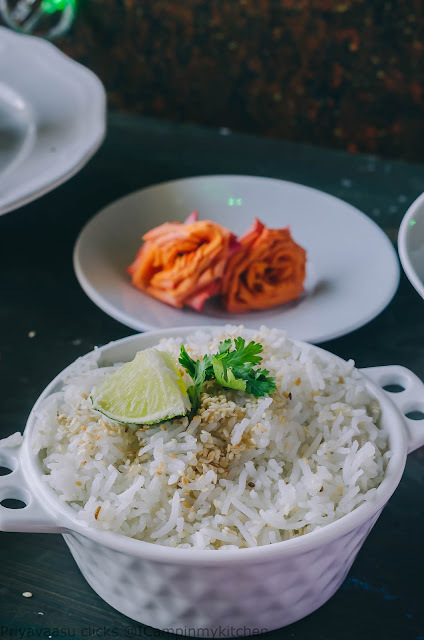 Let this cook in a medium flame, once it starts to boil, let it be on the stove for 10 minutes for the raw smell of the rasam powder to evaporate. Add another 1 cup of water to this. If you feel the rasam is too thick, add another 1/4 cup to 1/2 cup of water to it. Let this simmer in a slow flame for the rasam to froth well on top. Garnsih it with fresh coriander leaves and remove it from the flame.